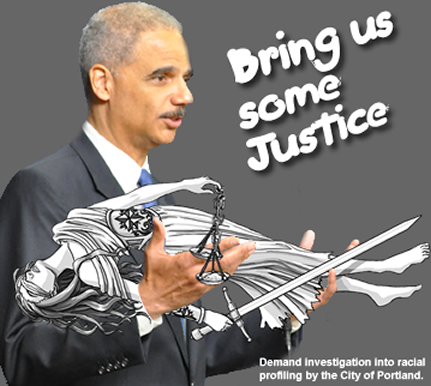 Called out to investigate racial injustice, the DoJ declared it outside the scope of a subsequent investigation. It’s time they did the job. On 16 18 September, U.S. Attorney General Eric Holder announced researchers from UCLA, Yale, the John Jay College of Criminal Justice, and the Urban Institute have been hired to conduct a 3-year study of racial bias in law enforcement. * The DoJ has yet to announce which five cities will receive their attention. We provide for you a solicitation we’ve made of Edward Chung, Director of this new project in the DoJ’s Office of Justice Programs. We’ve asked the Feds to do what the AMA called them out here for: to audit our police bureau. We write at the suggestion of Jonathon Smith, with whom we worked during the recent Civil Rights Division determination of illegal policing by the City of Portland, Oregon. We, JoAnn (former, three-term Co-chair of Oregon’s House Judiciary Committee) and Roger Hardesty, have been active for some years in seeking racial justice in what has since become America’s whitest major metropolitan area. We follow with interest AG Holder’s announcement of a new, three-year federal initiative to study racial bias and reduce tensions between law enforcement agencies and the communities they serve. Could you inform us as to the selection process, for choosing candidate sites? We believe Portland should have your prime consideration. The Washington Post described the pending study as the National Initiative for Building Community Trust and Justice. When researching that terminology, we were led to a COPS grant page, which expired this past June. Where can we find more information on the roll-out of the recently announced initiative? Hopefully, your associates in the Civil Rights Division will attest to our skills at relationship-building. Our partnership, Consult Hardesty, instigated Speak Out! a public forum during the Portland investi- gation, creating an opportunity for the CRD to explain its mission and for the community to provide testimony. The US Attorney didn’t organize one, nor did the City’s Human Rights Commission: we have deeper, less fettered ties to broad-based community in this field of study than most. Ours is not only a position arising from community trust. With former PPB Chief Rosie Sizer, Jo Ann conducted joint police/community listening sessions which resulted in a (never implemented) Police Plan to Address Racial Profiling, adopted by City Council in 2009. In his 2010 effort, then-Police-Commissioner Leonard tapped Jo Ann as his appointment to help initiate and conduct a Police Oversight Stakeholder Committee. Regardless of which community you choose to study, our work in the field indicates need of a multi-jurisdictional approach to issues of procedural justice. Consult Hardesty understands a notable deficiency in obtaining racial justice when confining remedy to local authority engaged in violating the 14th Amendment: comprehensive resolution of racial profiling and illegal use of force require broader, systemic resolution. We have some perspective of interlocking state and county legislation and policies which underpin patterns and practices carried out at a city level. One benefit we offer, for centering these efforts on Portland, is a ripple effect likely to accrue from lessons learned. Consult Hardesty is currently a primary partner in organizing a regional convening among justice advocates throughout the Pacific Northwest. Achievements obtained here are likely to have broader implications. 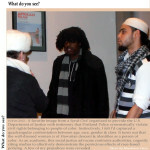 One unifying principle for the convening has been to demand improvements in data collection and analysis: if there is a contention of illegal policing by people of color, it would seem an epistemological study of the accrual of racial profiling data would help determine whether these perceptions are correctly held. We also encourage the study to view this as more than an opportunity to correct perception problems among victim classes. We encourage you to link collection of evidence of racial disparity to analysis of the DoJ’s ability to actually establish cases. Portland has credible stop data. After the CRD declared bias-based policing beyond the scope of their Portland investigation into civil rights violations (page 38), we can assure you that community trust will be enhanced through some self-examination on the part of the DoJ. We look forward to learning more of the AG’s initiative, and wish you success in implementing this important study. *We note AG Holder is intent on resigning from the Cabinet. Also, a new administration will be in office, even if government workers conclude their work on time. The study – announced to dampen tensions in 2014 – can be killed before the body ever issues a report. UPDATE: Mr. Chung responded on 6 October. He provided a link to Holder’s announcement, from which the above date was corrected. UPDATE: In our most recent conversation on this matter with Sen. Merkley’s staff, on 20 February we learned Mr. Chung had reported to them that “Portland is in the running” as a pilot site in the Initiative. Unfortunately, despite Sen. Merkley reaching out to Assistant Attorney General Karol Mason (DoJ’s Office of Justice Programs), we were unable to discern site selection criteria. This attempt to build community trust will not – at the outset, anyway – be transparent.